Most of the participants on this trip where not aware that Jan Jacobsen was also along — largely due to the fact that soon-to-be member Jan Jacobsen is not the same person as long-time member Janet Baker-Jacobsen. One would think that if we were to have name-duplication in the club, it would be some more common name such as Mel Zavodsky perhaps — yeah! 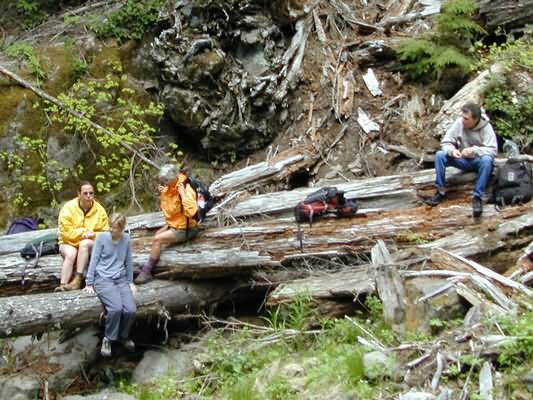 Anyhow, in spite of a few ticks and a tricky stream crossing, everyone seemed to enjoy this new-old hike. Can anyone remember if this has ever been on the schedule before? 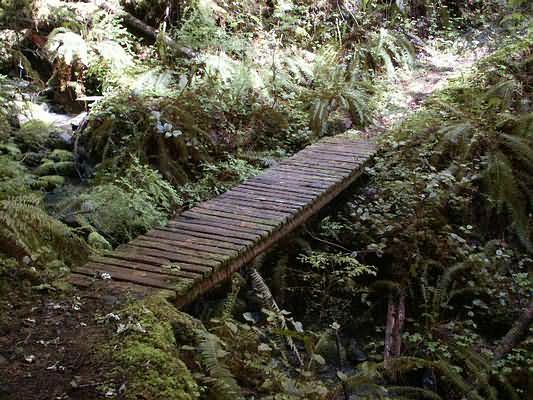 This trail used to be used by miners, and it extended all the way from its current trailhead at Mineral Campground up to the Knott Trail, giving access to the Bohemia Saddle and Bohemia City. 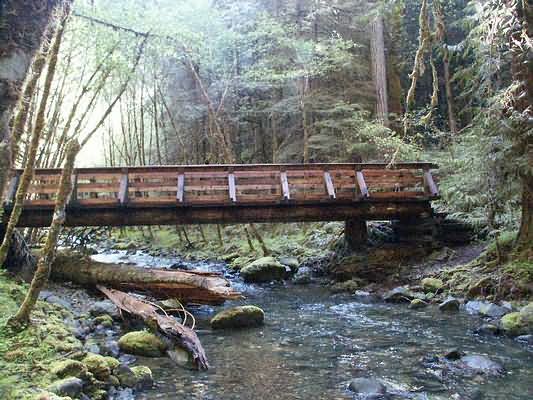 It now ends after about 3½ miles at an old clear-cut on a patent mining claim. We headed up the creek under partly-cloudy skies a little before 10 am. Being in no hurry, we paused at several old cabin sites to let Curtis take some photos. 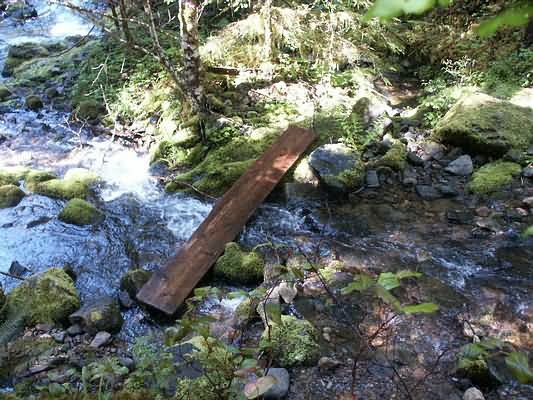 All were extra careful when crossing the several “Færie” trail improvements — a 12" wide plank across Walton Creek, some planks over a steep slide section, and a 16' long bridge. 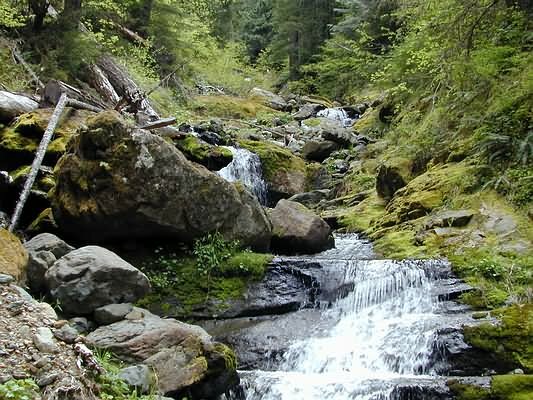 While the trillium and fawn lilies were bloomed out, they were replaced by others — creamy-white irises, false Solomons seal, little succulents about-to-bloom hanging from boulders, and many pink & white unidentified flowers. 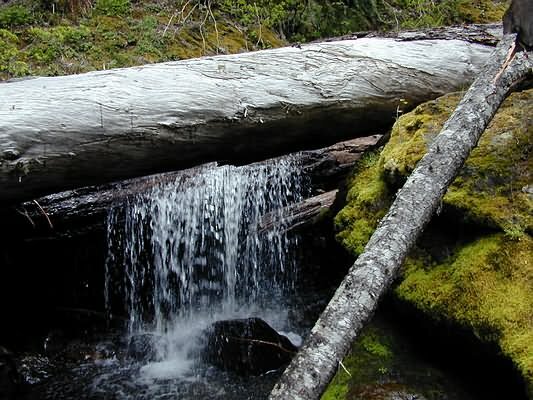 The only time we could not hear Fairview Creek gurgling and splashing on its way was on a short section of the trail which loops up Cinge Creek, when we could hear Cinge Creek instead! The clouds were pretty much gone by noon when we arrived at our lunch spot. 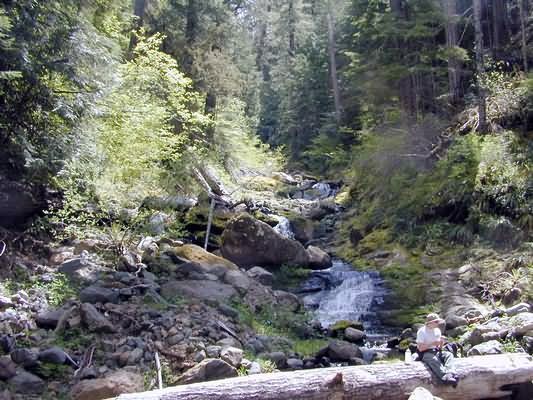 The trail comes out from behind some trees, exposing a view of about a hundred feet vertical of Fairview Creek, and many small cascades dashing over rocks and logs. After picking our jaws up from the trial and dusting them off, we each selected our own spot-in-the-sun-with-a-view and settled down for an hours lunch/rest. Some scrambled up-stream to get a closer view of individual pools and falls. Thanks to Rob and Sharon for providing limo service, to Sharon for ensuring no one escaped, and to all for lending helping hands at stream crossings and other trail difficulties. 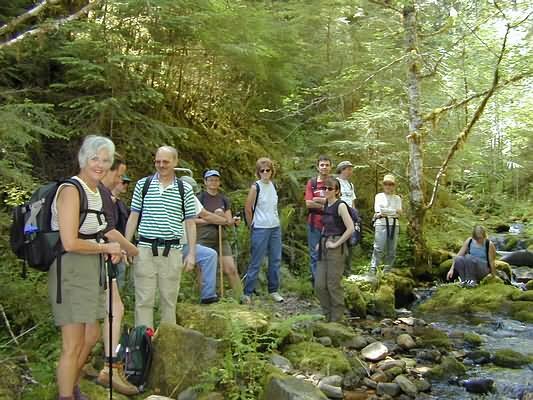 Creekers were Jennifer Baer, Lori Brown, Jim Fritz, Marlene Herinckx, Bob Huntley, Curtis Irish, Jan Jacobsen, Rob Kappa, Lucy Rayle, Sharon Thomas, Clare Tucker, Mel Zavodsky, and lead tick-bait & spider-web clearer Wayne Deeter.